As the first sitting president to take the podium at Family Research Council’s Values Voter Summit, President Trump may have offered history a footnote with his Oct. 13 speech, but by the following day his remarks were all but forgotten, as Steve Bannon’s stemwinder, a steaming stew of vitriol, splashed across mainstream media. On the Sunday shows, Bannon was the focus. 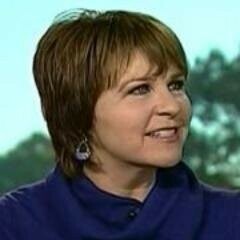 The former White House strategist, ousted from the West Wing in the days following the president’s mixed-messaging on the violence perpetrated by neo-Nazis and other white supremacists in Charlottesville, remains unrepentant. Before he joined the Trump campaign, Bannon courted some of those very same people at Breitbart to expand the reach of the site beyond more traditional conservative circles, according to a report by Joseph Bernstein of BuzzFeed. Now back at Breitbart, Bannon has free rein to push the dark worldview he’s peddled for years in the over-the-top, fear-mongering propaganda movies he’s produced, and the Christian right is lapping it up, all in the service of Bannon’s power-grab for control of the Republican Party. Beginning with Trump, conference speakers lauded attendees at this weekend’s gathering as the keepers of “Judeo-Christian values,” which were described as being under threat. Several, including former Rep. Michele Bachmann (R-MN) described Europe as having been lost to Islam, warning that the United States could be next. Despite the fact that the US takes in few refugees from Syria and other Muslim-majority countries, Frank Gaffney, a titan of the right’s anti-Islam cottage industry, dragged out a far-right hashtag for those few who make it in: “refujihadis.” Author Brigitte Gabriel, a Christian born in Lebanon, also railed against refugees from the war-torn nations of Africa and the Middle East, claiming they carried disease to the US and raped American women. They “hate America,” she said, and she gave a shout-out to Bannon, echoing his call for an end to Senate filibuster rules, which she said were stalling the implementation of Trump’s agenda. While the purported threat posed by Islam has been preached to the “values voters” in years past, gone this year was the veneration of so-called “free-market” capitalism as a core notion of right-wing Christian ideology, leaving Bannon’s rallying cry for economic nationalism to flood the zone. 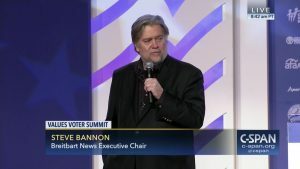 And in Bannon ally Sebastian Gorka, another former White House adviser to Trump, the Values Voter Summit for the first time featured a speaker known to proudly wear the emblem of a group sympathetic to the Nazi cause in Europe. Neither Bannon nor Gorka are regarded as being particularly religious. Neither is Trump. Just before the 2016 election, Christian pollster George Barna surveyed a group he calls “SAGE cons” — spiritually active, governance-engaged conservatives — and said found that a mere 1 percent described Trump as an exemplar of “Godly character.” Barna said his polling also found that 77 percent described Trump as “arrogant,” 61 percent as “rude,” 52 percent as “a bully.” Yet 91 of them percent voted for him anyway, Barna said in a breakout session. And at the summit, the assembled SAGE cons gave Trump gave a hero’s welcome. “We stand united behind the customs, beliefs and traditions that define who we are as a nation and as a people,” he added. The president suggested that “faith and prayer” could replace “federal regulation,” without specifying regulation of what. Trump didn’t need to spell out too much; he never specifically mentioned the NFL players whose firing he urged just weeks ago. He never mentioned the words “abortion” or “birth control.” He had learned the SAGE-con code: “America’s heritage,” “sanctity of life,” “religious freedom.” (Just in case anyone should miss his greater point, he did, however, boldly state that he would protect the world from “radical Islamic terrorism.”) As president, he could leave to others the specifics of the fearful, nationalist worldview that holds his base together. For that base, Trump is delivering, and he reminded them of all he has done — especially his naming of Neil Gorsuch to the Supreme Court. Plus, he’s undoing the legacy of the nation’s first black president. To sweeten the pot just ahead of his speech, he revoked the subsidies to low-income subscribers to Obamacare, and when he noted this, the crowd roared its approval. And from the looks of the audience in the room, I’d venture to say that a plurality, if not a majority, were on Medicare. At every Values Voter Summit since the first held in 2006, there is usually an overarching narrative theme, an action theme, and several threads that serve as a glimmering subtext. This year’s big, sprawling narrative was the threat to Western civilization posed by Islam in particular, and non-Western and nonwhite nations in general. The action theme was “war” on the Republican establishment in general, and Senate Majority Leader Mitch McConnell in particular. The decorative threads included the supposed threat posed by transgender people, various descriptions of feminism as either a “criminalization of masculinity” (Todd Starnes of Fox News) or a dead movement(Dana Loesch of the National Rifle Association), and a sustained attack by several speakers on the Southern Poverty Law Center, the civil-rights organization which, in 2010, famously added FRC to its list of hate groups “for knowingly spread false and denigrating propaganda about LGBT people,” according to SPLC Senior Fellow Mark Potok. Preceding a panel led by retired Gen. Jerry Boykin of FRC, conference-goers were treated to an anti-SPLC video produced by Prager University. Throughout the conference, different narrative strands were often woven together, as when Gaffney accused SPLC of working with the Muslim Brotherhood, presenting a slide featuring the two organizations’ logos side by side and naming it the “red-green axis” (after the colors of the respective logos). Gorka urged conference-goers not to fret over his and Bannon’s ouster from the White House. “The left has no idea how much more damage we can do to them as private citizens,” he said with a cartoon-villain inflection. That establishment, he said, is “personified by Mitch McConnell.” But the Senate majority leader, who was bashed by speakers throughout the conference, wasn’t the only one on Bannon’s enemies list, which includes Sen. Bob Corker (R-TN), despite Corker’s announcement that he will not run again. Corker’s crime, according to Bannon, is the fact that he dared to criticize “the commander-in-chief of the armed forces” while “we have young men and women in harm’s way.” Meta-message: Criticize Trump and Bannon will force you from office with the threat of a primary challenge. Bannon rattled off the names of sitting senators currently in his sights: Deb Fischer of Nebraska, Dean Heller of Nevada and John Barrasso of Wyoming. The problem with them, by Bannon’s lights, isn’t that they don’t vote with for the president’s priorities — they do. It’s that they haven’t come to the microphones to defend the commander-in-chief. 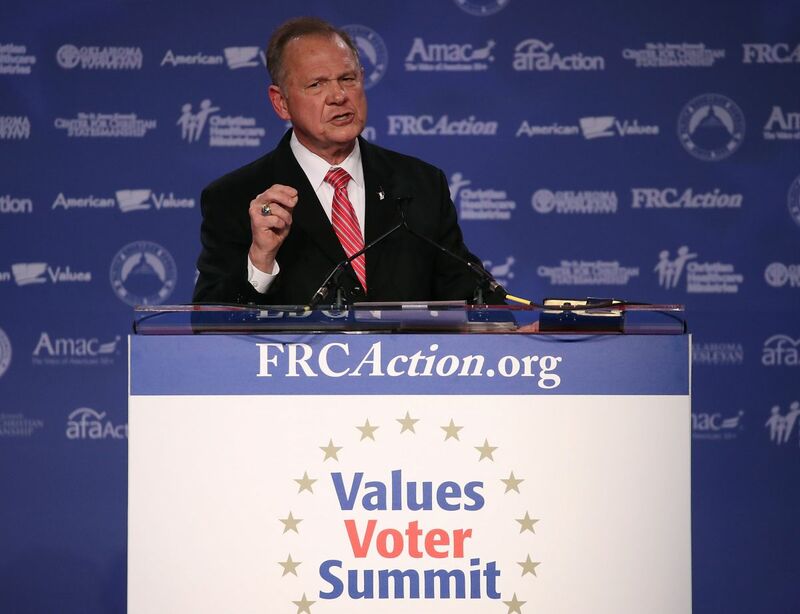 One of the Summit’s star speakers was Roy Moore, the former chief justice of the Alabama Supreme Court who, with Bannon’s support, unseated incumbent Sen. Luther Strange in the Sept. 26 Republican primary. The incoherence of Moore’s speech mattered not, as he is the walking, talking embodiment of Bannon’s formula for seizing power within the GOP: A dark, hypernationalist, racialized identitarian ideology dressed in the language of Christianity, contempt for the US Constitution and the promise of violence to come. Moore is also the gauntlet thrown by Bannon at Trump’s feet. The president endorsed Strange in the primary matchup, enduring an embarrassing loss. Soon after Moore won the primary, Trump deleted his tweeted endorsements of Strange. For Trump, few epithets pack more punch than “loser.” Bannon likely thinks he’s found the formula to keep Trump doing his bidding. And perhaps he has.